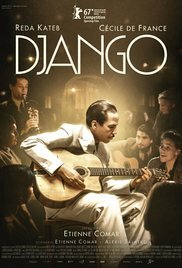 As a driving force behind European jazz, and being such an influence on so many guitar players, Django’s legacy is something other than as a war icon. The film certainly could have benefited from more attention to either how his music gained popularity, or what drove him to avoid any political notoriety until it was too late for many of his fellow Gypsies. Admittedly, his escape was crucial and led to his 1945 score, “Requiem for Gypsy Brothers”, of which his conducting leads to the most emotional moment of the film. This entry was posted on Thursday, January 4th, 2018 at 10:36 pm and is filed under Drama, World Cinema/Foreign. You can follow any responses to this entry through the RSS 2.0 feed. You can leave a response, or trackback from your own site. First, Happy New Year my friend. Second, I’ve been remiss not checking your reviews lately, been caught up in all sorts of things, one of which I shall email you about soon, with pleasure (it’s the good kind of thing). Finally, I am familiar with THE Django, subject of this movie, so I will most certainly watch it. As usual your review will better prepare me to get the most of the experience.